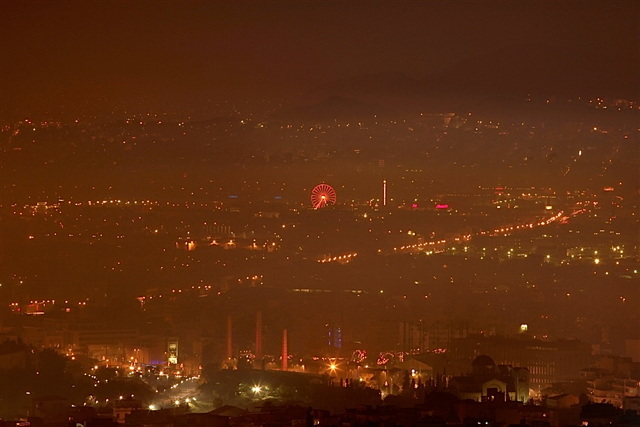 A haze of smoke hangs over the city skyline in Athens, early Thursday, Jan. 3, 2013. The cloud is the result of a massive switch to wooden stoves and fireplaces for heating as many households, already hard hit by the economic crisis, can not afford to buy heating oil after the cash-strapped government decided to harmonize taxes on heating oil and diesel fuel, leading to a 40 percent rise in the price of heating oil. File under "Coming Attractions." Soon to be playing at an Obamaville near you. A Ferris wheel is lit up and, presumably, running. If someone has the scratch to buy tickets for such a trivial delight, someone obviously is not being taxed enough. This sudden change of lifestyle must have been hard for the Greeks. With the smog visible over the city's skyline, it is very evident that a lot of people are greatly affected by this economic downfall. Burn wood, not atoms, they say. So I am burning wood to. My travels in Greece have been limited but IIRC there were not large swathes of forest suitable for supplying large quantities of fuel. This strike me as not merely a market distortion, but a sign of desperation. Oh, hell yeah! I LOVE the smell of hickory burning in the fireplace, but my guess they aren't burning wood quite so aromatic in Greece. Actually, I have really fond memories of one winter at a university in a former eastern bloc country in early '90's when the haze of coal smog would swirl in the headlights of the Trabis sputtering through the night. That smell of coal smoke certainly grows on you ... And even in you. Nothing spells progress like that morning hanky filled with black nasal residue! I told myself it was beneath my dignity to arrest a man for pilfering firewood. But nothing ordered by the party is beneath the dignity of any man, and the party was right: One man desperate for a bit of fuel is pathetic. Five million people desperate for fuel will destroy a city. That was the first time I ever saw my brother. But I knew him. And I knew that I would disobey the party. Perhaps it was the tie of blood between us, but I doubt it. We were only half tied anyway, and bothers will betray a brother. Indeed, as a policeman, I would say, get hold of a man's brother and you're halfway home. Nor was it admiration for a better man than me. I did admire him, but I didn't think he was a better man. Besides, I've executed better men than me with a small pistol. I told them who I was: The old man was hostile, the girl cautious, my brother... seemed very pleased. I think the girl was only one who guessed at their position. Sorry, I was going for the stealing firewood quote, but the rest was so beautiful, I had to leave it all as a piece. Since 2009 I've seen a per gallon heating oil price increase from 2.79 to 3.79 per gallon this year. At the current rate I'll be using about 2/3 of a tank for the entire winter, and it will cost $300 more than I paid in 2009. We keep the thermostat at 64 and supplement with space heaters on exceptionally cold nights to limit the consumption of oh so precious oil. Meanwhile my Section 8 neighbors - they who receive free rides to the emergency room, free medical care, food delivered via Meals on Wheels (with no seniors in the house), and have all bills paid for by my taxes - have their windows open to ventilate the various smoke they produce, and walk around in t-shirts and shorts in a temperature in excess of 72. I'm trying to find consolation for working my tail off to live as a pauper while the paupers live like the members of the kings court, but each winter that consolation eludes me. Hell the democrats brought enough of them over to America after the earthquake... I am sure most of them voted as well. Nah, it will never come to that for us. We got lots of oil right here at home, don't we? Good thing the lamp posts are not made of wood; I have a hunch, we gonna need 'em soon. Oh, and the hemp. Obama has the model to copy from and it appears he is trying his best.